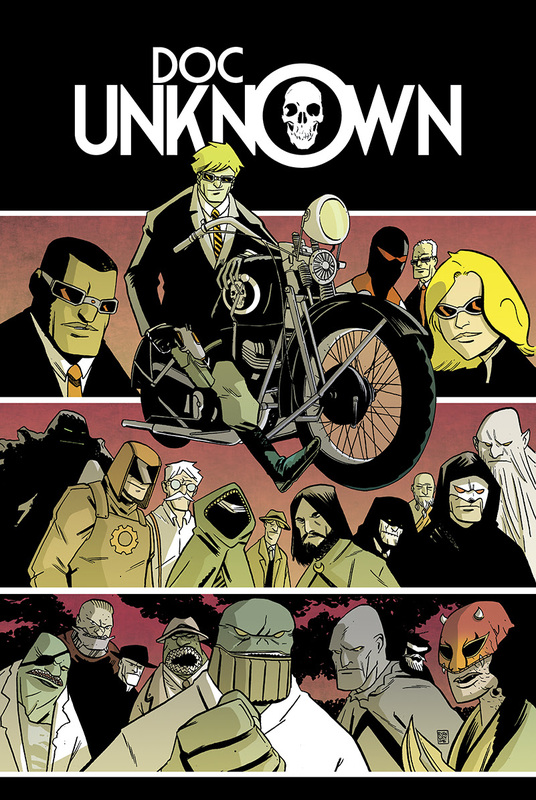 Dark Horse is excited to announce the hardcover collection of Doc Unknown, a pulp action comic by Fabian Rangel Jr. (Space Riders) and Ryan Cody (The Phantom). The Complete Doc Unknown contains Doc Unknown Volumes 1–3, the Boss Snake one-shot, and pinups by Mike Mignola, Eric Powell, and more. Hailed as “one of the very best indie comics series ever made” by IGN, Doc Unknown follows Warren Williams, a fighter pilot during World War II who crashes his plane and is taken in and trained by the warrior monks of the secret temple of Min-Yao. After a Nazi ambush, Warren returns to Gate City as Doc Unknown, a mysterious man fighting for good. Doc Unknown must protect Gate City from ruthless gangsters, monstrous mobsters, possessed museum attractions, evil secret societies, vampire ninjas, vengeful ghosts, hypnotizing fish-women, and much more! The hardcover The Complete Doc Unknown goes on sale July 19, 2017.